Good afternoon. I am Glenn A. Walsh of 633 Royce Avenue, Mount Lebanon. I have been an advocate of public transportation for more than 25 years. I was a charter member of the Allegheny County Transit Council, serving from 1984-1989. Today, I am representing no formal organization. In June, I attempted to address the PAT Board, to respond to Mr. Skoutelas’ letter. My second request to address the PAT Board was denied. When I claimed that the PAT Board was in violation of the Sunshine Act, I received a letter from the PAT legal counsel indicating that there is a loophole in the Sunshine Act that does not require the Port Authority Board to entertain comment from the public! In my April 23 address, I proposed ways the Port Authority could use the rail yard, while still constructing the Convention Center rail line. The Port Authority claims that physical limitations preclude the future use of the rail yard. It is my view that the Port Authority has purposely designed the Convention Center rail line in such a way, so that the rail yard can not be used—and they can get rid of a $2 million embarrassment that has never been used. Of course, I cannot go into great detail in just five minutes today. Attached to this statement is a copy of my statement to the PAT Board on April 23, which includes more details. This evening, when the Port Authority comes before you for their annual budget presentation, I am sure the current financial crisis will be the major topic of discussion. The Port Authority’s position is that they require some type of dedicated funding stream, to prevent such crises from recurring each year. And, I agree! However, there are a lot of people in this State, and in the General Assembly, who philosophically oppose dedicated funding for anybody. They fear that when an agency is guaranteed a certain amount of money each year, this agency will no longer strictly watch expenditures. With the proposal of the Port Authority to waste $2 million of taxpayers’ money by abandoning the Penn Station Rail Yard, I am very sympathetic to the perceived problems of dedicated funding. Dedicated funding to the Port Authority, or other agencies, can be efficient and effective, if there is very strong public oversight of the agency’s operation—even if that means some “micromanaging” of the agency by officials representing the interests of the taxpayers. It is clear to me that the Port Authority bureaucracy will not restrict expenditures on its own, without such strong public oversight. 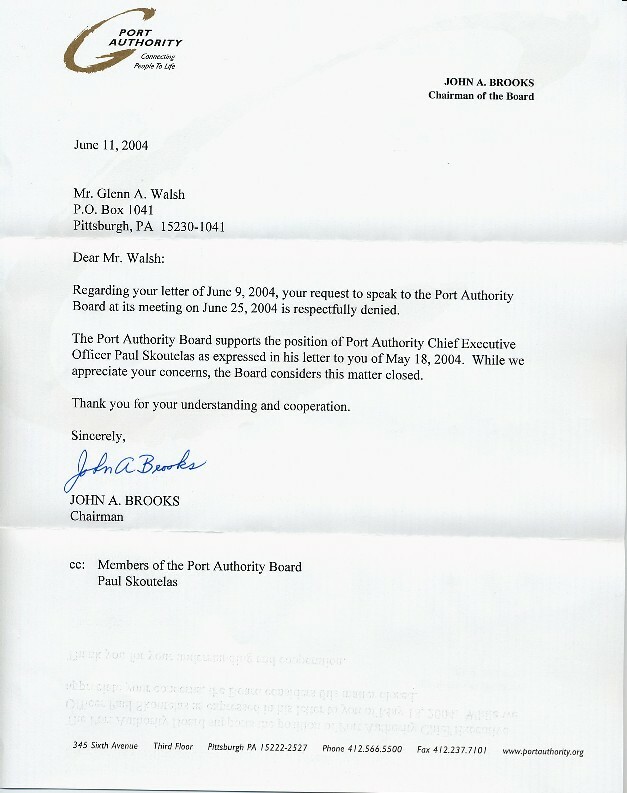 As I said, despite assurances to the contrary by Port Authority Board Chairman John Brooks, the Port Authority Board has never publicly discussed my April 23 statement. And, I am no longer permitted to address the PAT Board on this issue. PAT Management has told the Board that they cannot use the Penn Station Rail Yard, and, defacto, the Board has rubber-stamped the wishes of PAT Management. This does not show strong public oversight of Port Authority finances. I ask that this Council do what is necessary to install strong public oversight of the Port Authority, which will assure taxpayers that dedicated transit funding will be properly spent. I also ask that this Council investigate the Penn Station Rail Yard matter and prevent the complete waste of $2 million of taxpayers’ money.